Great tasting, 100% all natural caramelized gingerbread cookie spread for kids and grownups!! 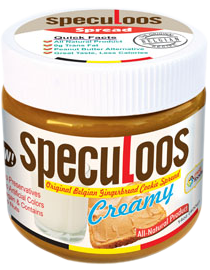 Speculoos is made from caramelized gingerbread cookie which was traditionally baked for consumption on St. Nicholas day in Belgium. The much loved cinnamon cookie has been transformed into a delicious spread. Our original Belgian recipe is created with 60% ground gingerbread cookies and ideal for those who want something unique for breakfast, lunch or dessert. The taste is wonderful on bread, toasts, or bagels and on just about anything. Go ahead and experiment the secret recipe that Europe has come to know and love.